Nuclear energy provides about 11% of the world’s total electricity today. This power source produces no carbon dioxide during plant operation, meaning it doesn’t contribute to climate change via greenhouse gas emissions. It can provide bulk power to industry and households around the clock, giving it a leg up on the intermittent nature of solar and wind. It also receives widespread contempt for a variety of reasons – many purely emotional and with little or no scientific grounding. 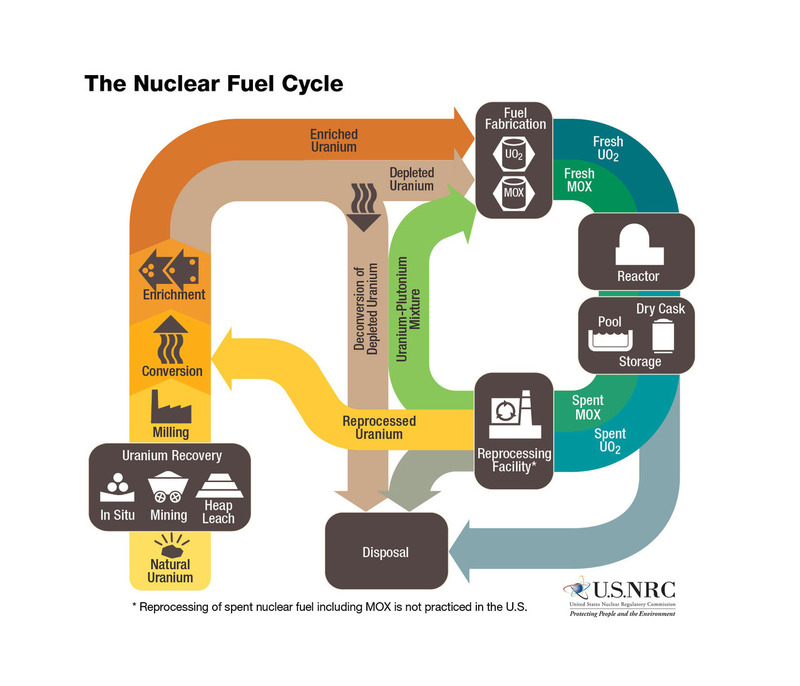 The most pressing legitimate issue is the management of used nuclear fuel, the waste by-product that needs to be removed from the reactor and replaced with fresh fuel to sustain power generation. Ongoing research is tackling this problem by attempting to figure out how to transform much of what is currently waste into usable fuel. 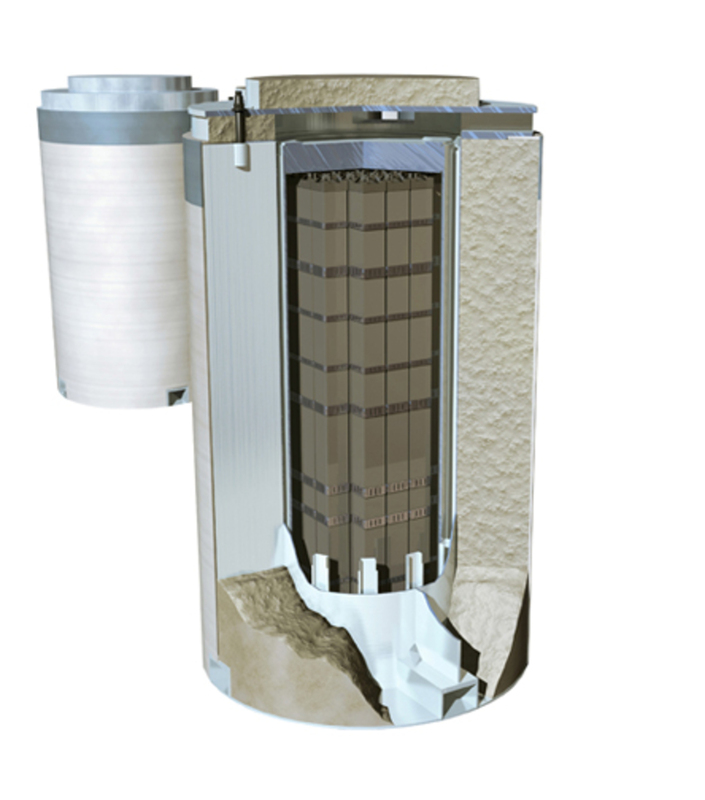 How do reactors generate nuclear waste? The reaction that produces energy in a nuclear reactor takes place in the nuclei of atoms – hence the name. One atom of uranium-235 (which contains 92 protons and 143 neutrons) absorbs a neutron and splits into two new atoms. This process releases large amounts of energy and, on average, 2.5 new neutrons that can be absorbed by other uranium-235 atoms, propagating a chain reaction. This process is called fission. The two new atoms are called fission products. They contribute to most of the short- to medium-term radioactivity of the fuel upon discharge from the reactor. Replacing some of the core and replacing with fresh fuel. Fission is most likely to take place in heavy atoms. Nuclear engineers and nuclear chemists focus on the heaviest elements – that is, the actinides, located at the very bottom of the periodic table. The fission process continues, consuming fuel, until the amount of burnable (fissile) atoms is no longer economical to keep using. Then the reactor is temporarily shut down for refueling. A third of the core is removed and replaced with fresh fuel. 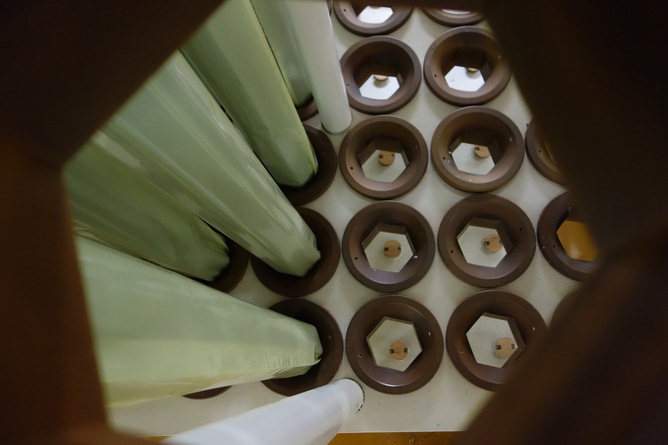 The remaining two-thirds of the core is shuffled around to optimize the power production. The leftover material, the used fuel, is highly radioactive and physically hot, and must therefore be cooled and shielded for safety reasons. 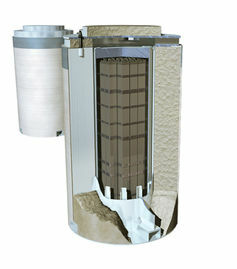 In a commercial power reactor, brand new unused fuel consists of 3%-5% uranium-235, with the balance being uranium-238. The heavier uranium-238 isotope will not fission but can transform to an even heavier isotope, uranium-239, via a process called neutron capture. Continued neutron capture eventually produces a suite of elements heavier than uranium (so called trans-uranics), some of which will fission and produce power, but some of which will not. These trans-uranic, actinide elements – including neptunium, plutonium, americium and curium – have one thing in common: they contribute to the long-term radioactivity of the used fuel. After the energy-generating fission reaction, the fission products’ radioactivity decreases rapidly. But because of the other trans-uranic elements in the mix, the material needs to be isolated until deemed safe – on the order of millions of years. 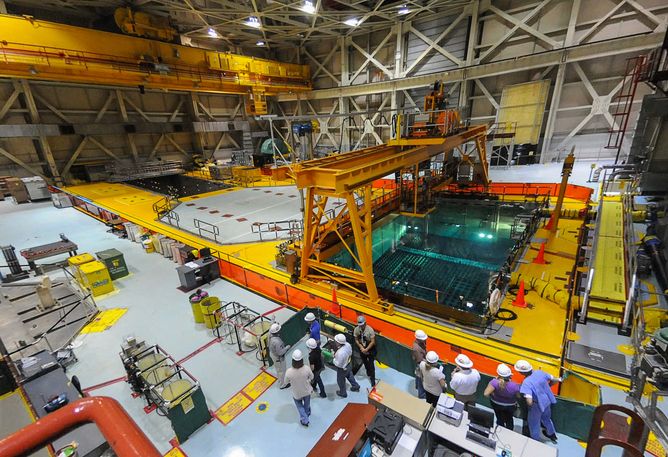 At least 23 feet of water covers the fuel assemblies in the spent fuel pool at the Brunswick Nuclear Power Plant in Southport, North Carolina. Upon discharge from the reactor, the used fuel contains only about 3%-4% fission products. The rest is uranium and trans-uranics that weren’t part of the fission reaction. Most of the material is the original uranium-238, still perfectly suited to use in new fuel, as is the remaining uranium-235 and the plutonium-239 (combined about 1.5% of the used fuel). Disposing of this material as waste is like taking one small bite of a sandwich and then throwing the rest in the trash. It’s no surprise then that several countries are recycling nuclear fuel to recover the remaining useful material. Other countries are revisiting these options, at least on a research basis. A typical power reactor (1 GWe) produces about 27 metric tons of used fuel each year, in order to generate the electricity needed to power 700,000 homes (assuming an average American home consumes about 11,000 kWh annually and a power plant has an average capacity factor of 85%). For comparison, a coal plant of similar power output will produce 400,000 metric tons of ash. Once spent fuel has cooled, it’s loaded into special canisters. The world’s nuclear power capacity is on the order of 370 GW, which corresponds to about 10,000 metric tons of used fuel generated each year worldwide. The total amount of used fuel in the world (as of September 2014) is around 270,000 metric tons, of which the US is storing about 70,000 metric tons. Removing uranium and plutonium from used fuel relies on a chemical process. Reprocessers dissolve the used fuel in acid and treat it with organic solvents to selectively remove the elements of interest and leave the unwanted elements behind. Commercial plants all use more or less the same method, PUREX (Plutonium Uranium Reduction EXtraction). Originally invented in the US in the late 1940s, over the years PUREX has been adapted slightly to improve its performance. This process doesn’t separate out elements heavier than plutonium. The waste product after the reprocessing still needs to be isolated for what is essentially an eternity. The benefit, though, is that it can recycle about 97% of the spent fuel, massively decreasing the volume of waste. The bulk of the material can then be made into new reactor fuel containing a mix of uranium and plutonium, so-called mixed oxide or MOX-fuel. Major reprocessing plants are located in the UK, France and Russia. India has some capacity, and Japan has a reasonably large plant that was recently completed but is currently not used. Global reprocessing capacity of commercial fuel is around 4,000 metric tons per year. To date about 90,000 metric tons of used fuel has been reprocessed, about 30% of the total amount of used fuel produced in commercial reactors. Some countries that do not have their own reprocessing plants ship material to countries that do, such as France. It’s expensive to invest in reprocessing infrastructure. It can also be a political decision not to do so, as in the US, because the technology can be used to create material for weapons (this was the original use in the 1940s). Of course, all reprocessing plants are under the scrutiny of the International Atomic Energy Agency, and must account for all processed material to ensure that nothing is diverted for potential use in weapons. IAEA inspectors seal the spent fuel pond at Dukovany Nuclear Power Plant in the Czech Republic. 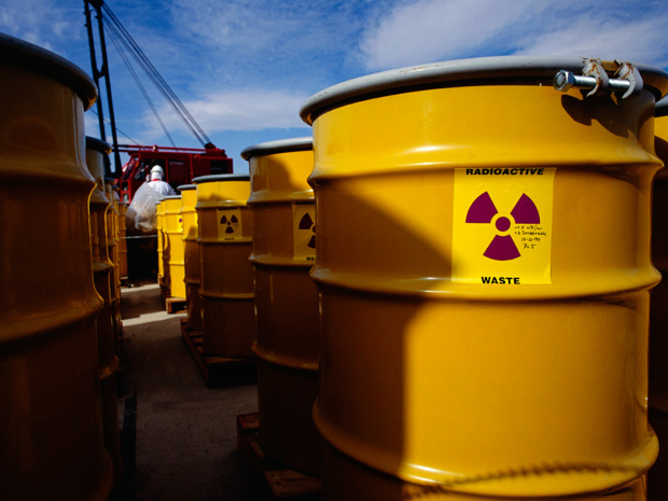 But that level of reprocessing doesn’t completely solve the issue of used nuclear fuel. My research at UC Irvine, as well as that of other labs around the world, focuses on new ways to deal with the last few troublemakers in the used nuclear fuel. We’re working on how to remove the remaining long-lived trans-uranic actinides with an efficiency high enough that the remaining nuclear waste’s isolation time would be decreased to 1,000 years or less. Maybe this still sounds like a long time, but the world is full of structures that have lasted for more than 1,000 years; we should be confident that we can construct something that will last a millennium. We could also, with reasonable confidence, create signs or informational material to mark the storage that people 1,000 years from now could reliably interpret. While removing uranium and plutonium is readily done (as via PUREX), the next separation step is a grand challenge for various reasons. One is that many of the remaining fission products behave chemically very similar to americium and curium. This requires highly specialized chemicals that are often complex and expensive to synthesize. The radioactive nature of the material provides an additional layer of complexity; the radiation is not only hazardous for people but will also break down the chemicals needed for separation and may speed up corrosion and damage the equipment used in these processes. The research efforts under way focus on developing new chemical reagents that are more stable with regard to radiation, more selective for the elements we are interested in recovering, and easier to make. Because of this, a lot of effort goes to fundamental studies of the chemical interactions between reagents and elements in used fuel. The problem at hand has been described as a chemists’ playground and an engineers’ challenge. The bottom line is that none of this is science fiction. 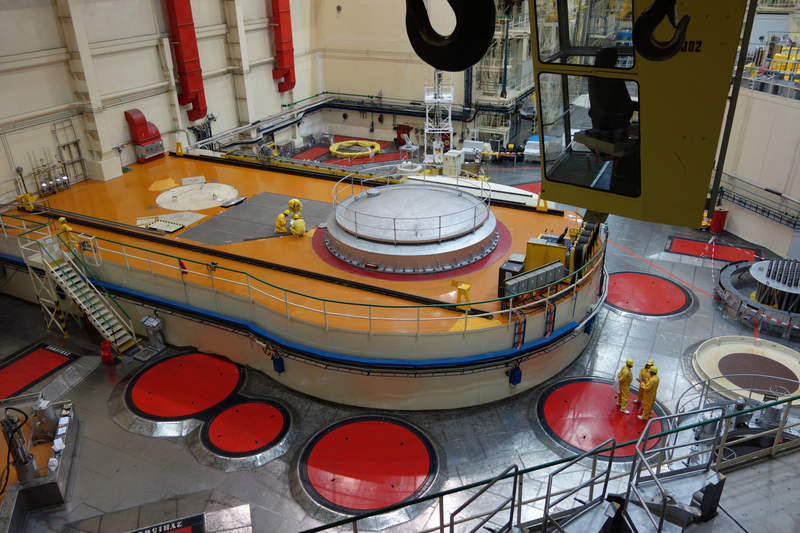 Getting to a point at which almost all nuclear waste can be repurposed poses a grand challenge, perhaps comparable to putting a man on the moon, but it is not impossible. Mikael Nilsson is Associate Professor of Chemical Engineering and Materials Science at University of California, Irvine.